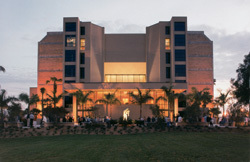 Located on the campus of the Edison College in Fort Myers, the Barbara B. Mann Performing Arts Hall features the largest proscenium stage in Southwest Florida. The 1,871-seat facility also features a full service in-house box office, an in-house boutique and full service concession bars. New York's major touring musicals such as The Phantom of the Opera, Riverdance, Mamma Mia!, The Producers the new Mel Brooks musical and Disney's The Lion King have played this beautiful venue. In addition, legendary stars such as Bill Cosby, Paul Anka, Anne Murray, Johnny Mathis, Tom Jones, Willie Nelson, James Taylor, Norah Jones and Steely Dan have graced the stage. No matter what your preference, The Mann Hall is definitely the place to be for great entertainment. Call (239) 481-4849 for information on upcoming shows or visit our website at www.bbmannpah.com.